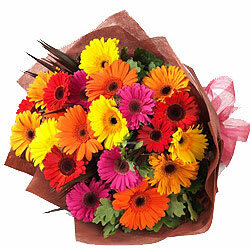 Create a beautiful world for your loved ones by sending this Ornamental Bunch of 15 Multicolored Gerberas wrapped up in the essence of your love and warm feelings. This radiant Bunch of 15 Mixed Gerberas is decorated with lots of Greens. Bring smiles on the faces of your dear ones with this gift of Fashionable Bunch of 20 Mixed Gerberas and make your bond stronger.